how beautiful can your earrings be? Earring finding are often also classified as "earring component". Both are synonmous generic industry term which covers all the bits and parts you would use for making earrings. They include earring chandeliers, ear studs, ear posts, earring connectors, ear wires, and much more. There is an endless variety of earring finding. Basically anything that you can use to make earrings or parts thereof can be classified under this umbrella term. 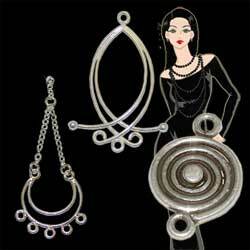 There are many types of earring hooks, in a variety of styles. They are all known as earring hooks though sometimes the terms are used interchangeably and synonymously with each other. They can also be specifically named, according to their styles or shapes. This earring finding consists of a metallic post that goes through the hole in the ear and is secured at the back of the ear, usually with a butterfly nut. Both the front of the post and the backing can come in a variety of styles. The stud in front can be plain, studding with gemstones, or have a wide range of decorative styles. The nuts can be the standard butterfly nuts, solid cones, or wider based nuts with intricates designs of their own. These are used on earring posts, behind the ear, to hold the earring in place. The standard, smaller ones are generally called butterfly nuts. Comfort clutches are generally larger and are required for larger or heavier stud earrings. 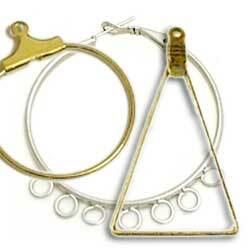 They provide more stability and will prevent the heavier earring from droop or being lop-sided when worn. These are suitable for people who do not have pierced ears. They snap on or screw securely into place and usually have a loop below the clip to attach dangles and beaded jewelry. Ear Threaders are also known as "Earring Threads", "Ear Threads", "Threader Earrings", "Earthreads", "Pull Through Earrings". They consist of fine and long pieces of chain with a thin, solid piece of metal (post) at one end. This is used to thread through your earring hole, with a piece of chain on each side of the ear. Ear threaders normally have a loop at one end to hold dangles and bead. Simple designs work very well with these earring findings as the chains themselves form eye-catching and interesting, free-swinging parts of your ear adornment. Ear threaders come in various designs and materials. 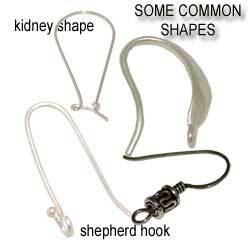 The two most popular and common ones are the Straight Ear Threader and the U-Top Ear Threader. The latter has a half-curve near the end which allows it to rest securely across the pierced ear hole. While providing more security, it is not length-adjustable like the Straight Ear Threader. Ear Threaders are very comfortable to wear because, instead of having a hard, inflexible metal in your ear, you have a fine, flexible chain. The straight post is used to thread the earring through the ear, allowing you to easily lengthen or shorten the look of your earrings. Do not use too heavy beads or dangles as the weight of them may cause the threader earring to fall out. It is also a good idea to have a clear rubber earring stopper, esp. if your beads & dangles are heavy. Get longer earring threader (they are usually from around 3 to 5 inches/ 7 to 12.5 cm) for a dramatic look by thread through 2 pierced holes on the ears. Chandelier earring findings are very interesting and often adds a professional feel to your work. The range of these earring components is awe-inspiring as they can range from very chic and simple, to elaborate pieces of artwork. The arrangements, embellishments, and designs that you can create with them is quite endless. Earring hoops are most commonly round but they can come in any shape .. and size. Beads can sometimes be threaded directly onto the hoops, or hung from them. Metallic threads or chains can also be 'woven' onto the loops to create very glitzy and unusual creatings.